Although I remember seeing goat’s cheese on the shelves of British supermarkets, other than feta, I don’t remember ever seeing any cheese made with sheep milk. 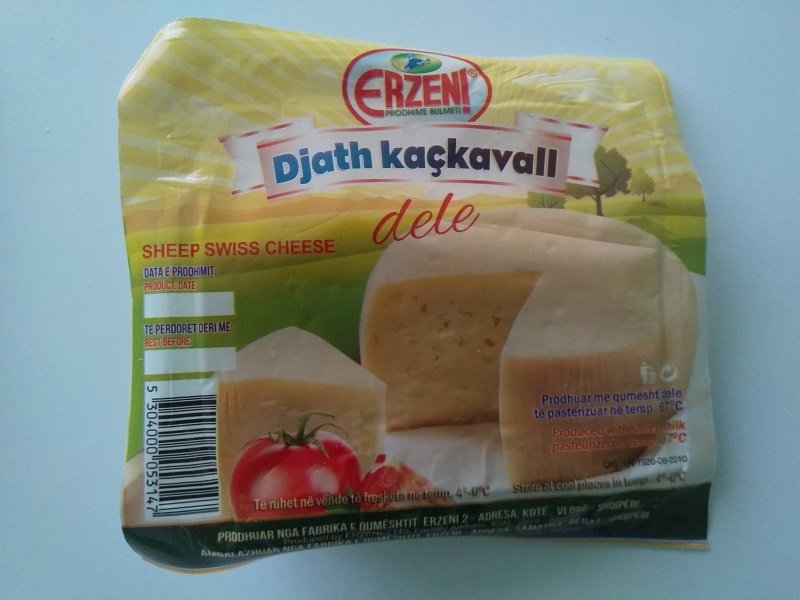 Nor do I recall seeing any for sale in the Netherlands during the time I was living there, but it’s possible to buy sheep milk cheese here in Albania. I bought some yesterday and tried it for the first time today. The brand is Erzeni and, although it says “Swiss Cheese” on the wrapper, it’s actually made in Albania. So it must be a Swiss Cheese Recipe made in an Albanian way. When I bought the cheese, I had no idea if I would like it. How would I? 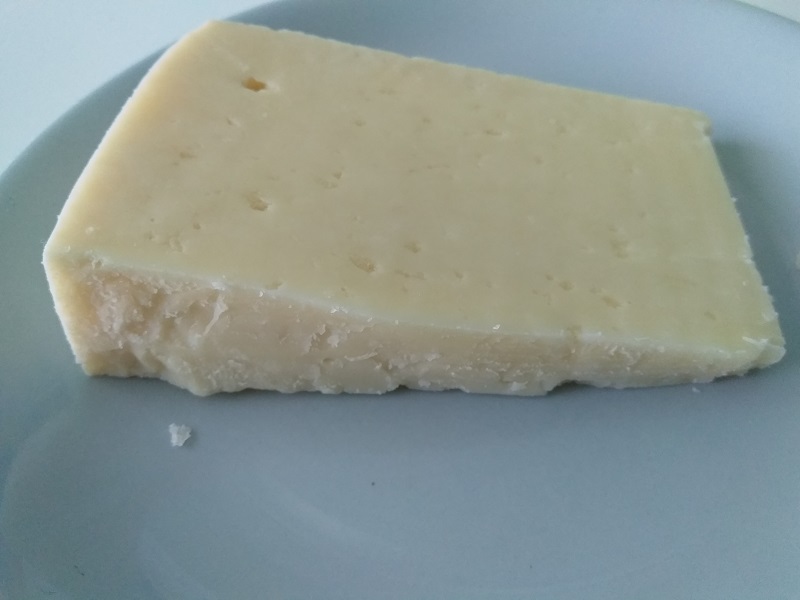 Up until a few days ago, I had no idea it was possible to buy blocks of hard cheese made from sheep milk. Like a lot of people, I am always keen to try new things, so I decided to try it. Though it wasn’t without a certain amount of apprehension. I absolutely do not like goat’s cheese. I’ve tried that before, more than once, and it’s not to my taste at all so I knew eating sheep’s cheese may not be a pleasant experience. Even as I cut through the plastic to get at the cheese, I knew I’d made a mistake in buying it. The smell that drifted up to my nostrils was not pleasant at all and it’s a smell that takes a lot of soap and water to wash from your fingertips. As for the taste, I hate it. Not as much as goat’s cheese, but this type comes a close second and it has the kind of taste that repeats on you. Strangely enough, up until a couple of weeks ago, I’d never eaten feta cheese. Although I’ve seen it for sale in supermarkets in many countries I never wanted to try it. However, when I was in Athens, I became curious to try some in a Greek salad. I never got around to it while I was there, but I had a Greek Salad here in Albania and thought the feta cheese tasted reasonably okay. This other type of sheep’s cheese does not taste the same at all. I forced myself to finish eating the two sandwiches I made with it and then fed the rest to the bin. In England, there’s a saying that “the proof is in the pudding”. It means you have to try the food before you will know if you like it or not. In this case, the pudding does not taste too sweet. My cheesy experiments are over. No more sheep milk cheese for me.